For St Patty’s Day, corned beef on rye! There may be Irish in my ancestry, but the love of food made my choice for a St. Patrick’s Day meal an easy one. A quick ride on the Green Line took us to Michael’s Deli in Coolidge Corner for New York quality corned beef on rye with just a smear of mustard. I owe the gang over at Chowhound.com for introducing me to this Boston area treasure. Last year, these food scouts began a discussion of corned beef sandwiches. Some of the most reliable posters said Michael’s had the best in the area. Great corned beef was something I knew a bit about. I’ve been visiting New York delis since I was a kid. I worked in retail for years and would grab deli take-out to eat on the train ride back from the city. Great deli is one part of New York that I used to crave. And so, I was off in a flash for a personal taste test. A week later I took a friend to taste again. Now I head straight to Michael’s whenever my corned beef cravings take hold. Michael’s corned beef is leaner than most of what you’ll find in Boston – with just a spec of fat for flavor. You won’t find yourself chewing at big pieces of fat or picking them out of the sandwich as you go along. Perfectly thin slices are piled high enough to require a big bite without being an impossible sandwich to handle. Last year, I had the opportunity to compare Carnegie Deli to Michael’s in the same week. An assignment took me on a quick trip to NYC where I had lunch at Carnegie Deli. Michael Sobelman can hold his head up with pride. His sandwiches stood up to the test. 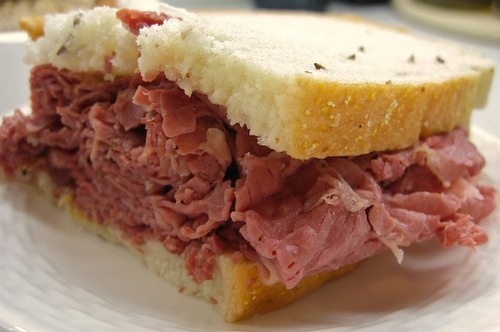 I preferred the bread at Carnegie, but the corned beef came up as a tie game. While I’m stuck on corned beef, Ed had been a lover of Michael’s “Pig Out” sandwiches- roasted pork, stuffing and cranberry sauce on the toasted bread of your choice. Alas for him, they are no longer making the pork. 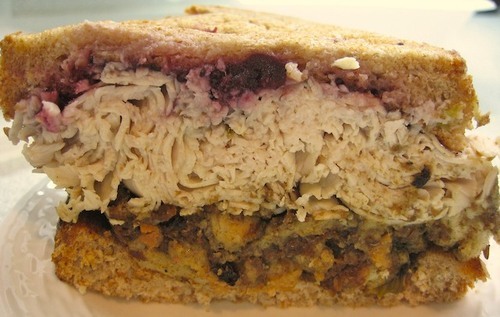 But, the stuffing and cranberry sauce are available with a pile of turkey in the “Thanksgiving.” And, Michael offered to create a version of the sandwich for him with any of the other meats on the menu. Ed loves the stuffing which is spicy and satisfying. The cranberry adds just the right moisture and sweet touch to the combo. We each had half of our sandwich and sampled bites of one another's. The other halves are tucked away for noshing later in the day. While the sandwiches are not as large as Carnegie’s, they are too big for me to finish in one sitting. And, they are a better value at about half the NYC deli’s price. While waiting for our meal, we asked Michael about his favorite sandwich on the menu. He was quick to say, “brisket.” Next trip, I’ll add one of those to our order and report on it. By the way, there are a few items you may want to add to your order. Start with extra pickles. They serve perfectly-spiced, half-sours with the sandwiches but I always want a few more. They also carry a great assortment of drinks that fit the NYC deli setting. And, be sure to review what is in the deli case before ordering. You may want to add meatloaf, knishes, stuffed cabbage or one of their salads to your meal. We always do take out because, while there are a few tables along one wall at Michael’s, you really can’t count on eating there. The tables are usually full, and you could have a wait even if Michael enforces his “no reading, the library is down the street” rule. In warmer months, you can picnic near by. There are a couple of benches right next door. You can see them in Google’s “Street View” of the address. There are also several benches along Webster Street about half a block further down Harvard from Beacon. Here are links to some other opinions.